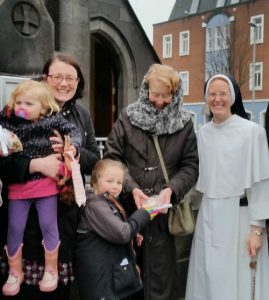 Members of the Bracken family giving out statues of Baby Jesus outside St Saviour Church in Limerick, December 2017. In our time, especially in Europe, we are witnessing a sort of “distortion” of Christmas, Pope Francis told pilgrims to Rome at his General Audience on Wednesday. “Without Jesus there is no Christmas,” he said, “there is another party, but not Christmas. If Christ is in the centre, all the other magical characteristics of the celebration, the “lights, sounds, various local traditions, including the characteristic foods, all combine to create the atmosphere of the celebration properly, but only when Jesus is at the centre,” he stressed. If we take Jesus away, he continued, “the light goes out and everything becomes fake”. The Pope’s words on 27th December 2017, gave voice to an initiative begun in the Focolare movement some years ago which aims to put Christ back at the centre of Christmas. The project was inspired by an article written by Focolare founder, Chiara Lubich, who recounted an experience of visiting one of the main shopping streets in Zurich at Christmastime. Walking down a city centre street she saw the wonderful Christmas displays in the shop windows, but none had anything to do with what Christmas was really about. “There are toys and Christmas songs… Santa is there, snow and Christmas trees but where is Jesus?” she wrote. “This rich world has trapped Christmas and all that goes with it and has evicted Jesus!” She concluded the article with an appeal to “shout out Who is born, celebrating his coming as never before”. In response to her appeal, for some years, particularly in European countries, children have been handing out statues of baby Jesus around Christmastime, asking adults to “bring Jesus home for Christmas”. In Limerick for example, a family handed out the beautiful hand crafted statues of baby Jesus after the 1.00pm mass at St Saviour’s Church in the city centre on 17th December. Father of four, David Bracken stood up at the end of Mass and asked the parishioners to take a ‘baby Jesus’ in order to give it to a family member or friend who doesn’t have a crib this year or maybe who has stopped coming to Mass. After Mass he stood his wife Méabh, with their children Lucia (11), Carmel (6), Frances (2), Tomas (1), outside, offering the little statues to the people as they left. “People were really delighted to take the statues many of them taking more than one to give to their children. Many commented on how beautiful they were,” Méabh Bracken told CatholicIreland. She said the family and friends and relations who have collaborated on project were delighted to be involved in the action and any money raised through contributions for the statues, will go straight to support hurricane victims in Puerto Rico.